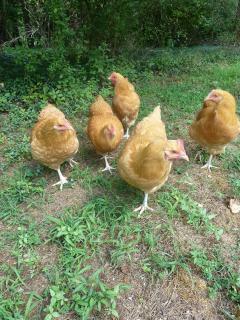 So I decided we need chickens. My brother is on a renal diet, and eggs are one of the things he can eat that he enjoys. I am chief cook and bottle washer, zoning is fine, we have an unused dogpen, so into the adventure we came. I did some research, I have had chickens a while ago, and they were 'barn chickens' alas, we had a flash flood and, well at least the barn was still standing... but they were free range and these are not. Too many preditors here in suburbia. Really, 68 acres in Cumberland Va, I think we lost one to a hawk, Midlothian Va, we have foxes, racoons, opossums (ughghhh) a coyote or two, hawks, owls and of course the random loose dog. So Last March I went ahead and got the girls, started with 4, lost one to a hawk coming throught the netting on the pen, with my sister standing right there... decided I could not just bring one new girl in so now we are at 5 and holding. (for now) I have 5 of the cutest, funniest friendliest BO You'd ever want to see.